Dr George Nash of Bristol’s Department of Archaeology and Anthropology said the engraving, found by geologist Alan Bowring, could be more than 4,000 years old. Mr Bowring came across the stone last year while he was examining the site, on land maintained by the National Trust, for clues to its geological history. Its precise location in the Brecon Beacons has not been revealed. The stone, which measures around 1.45m by 0.5m, has 12 cup (hollow) marks of various shapes and sizes on its face. Now lying flat on the ground, it could once have stood upright and served as a way marker (standing stone) for farming communities. Such stones have been discovered in other parts of the UK but are rare in mid-Wales. Based on the shape of the stone and its engravings, Dr Nash believes it probably dates from the Early to Middle Bronze Age period: 2,500 BC to 1,500 BC. 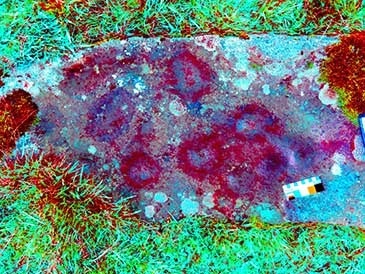 Dr Nash said: “There are a large number of prehistoric ritual sites in the Brecon Beacons but this is the first evidence of prehistoric rock art ever to be recorded in this part of Wales. As part of a much wider research project, Dr Nash will be undertaking, along with a team from the National Trust and the Brecon Beacons National Park Service, a thorough landscape survey of the immediate area. A fundamental part of the survey will be to trace and digitally record the cupmarked stone.